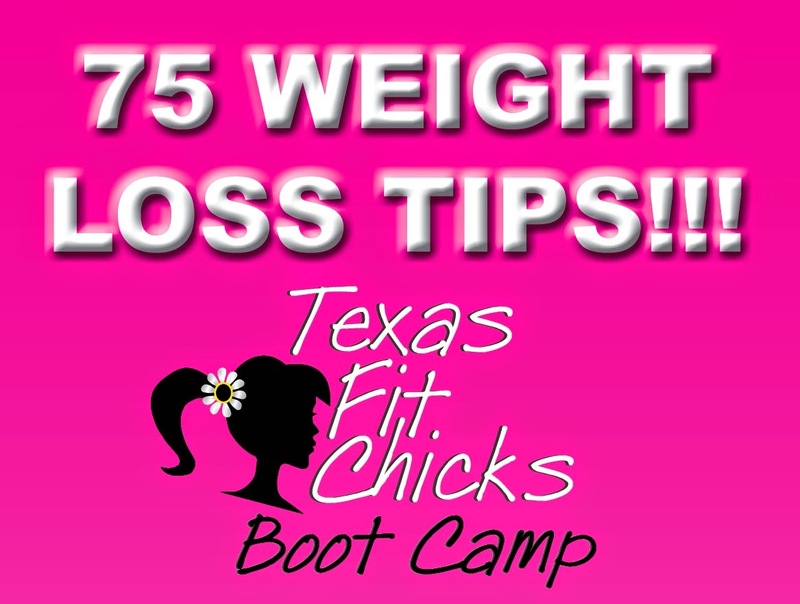 Here are 75 weight loss tips from Texas Fit Chicks! I can only handle 1 change now. What should it be?? Eating out? Halve it, and bag the rest. A typical restaurant entree has 1,000 to 2,000 calories, not even counting the bread, appetizer, beverage, and dessert. When dining out, make it automatic: Order one dessert to share. See what you eat. Plate your food instead of eating out of the jar or bag. Overeating is not the result of exercise. Vigorous exercise won’t stimulate you to overeat. It’s just the opposite. Exercise at any level helps curb your appetite immediately following the workout. Drinking too few can hamper your weight loss efforts. That’s because dehydration can slow your metabolism by 3 percent, or about 45 fewer calories burned a day, which in a year could mean weighing 5 pounds more. The key to water isn’t how much you drink, it’s how frequently you drink it. Small amounts sipped often work better than 8 ounces gulped down at once. Skipping breakfast will leave you tired and craving naughty foods by midmorning. To fill up healthfully and tastefully, try this sweet, fruity breakfast full of antioxidants. In a blender, process 1 c nonfat plain or vanilla yogurt, 1 1/3 c frozen strawberries (no added sugar), 1 peeled kiwi, and 1 peeled banana. Pulse until mixture is milkshake consistency. Makes one 2-cup serving; 348 calories and 1.5 fat grams. If you’re famished by 4 p.m. and have no alternative but an office vending machine, reach for the nuts—. The same goes if your only choices are what’s available in the hotel minibar. Next time you’re feeling wiped out in late afternoon, forgo that cup of coffee and reach for a cup of yogurt instead. The combination of protein, carbohydrate, and fat in an 8-ounce serving of low-fat yogurt will give you a sense of fullness and well-being that coffee can’t match, as well as some vital nutrients. If you haven’t eaten in 3 to 4 hours, your blood glucose levels are probably dropping, so eating a small amount of nutrient-rich food will give your brain and your body a boost. Making just a few changes to your pantry shelves can get you a lot closer to your weight loss goals. Here’s what to do: If you use corn and peanut oil, replace it with olive oil. Same goes for breads—go for whole wheat. Trade in those fatty cold cuts like salami and bologna and replace them canned tuna, sliced turkey breast, and lean roast beef. Change from drinking whole milk to fat-free milk or low-fat soy milk. This is hard for a lot of people so try transitioning down to 2 percent and then 1 percent before you go fat-free. How do I avoid late-night eating?? Eat your evening meal in the kitchen or dining room, sitting down at the table. Drink cold unsweetened raspberry tea. It tastes great and keeps your mouth busy. Change your nighttime schedule. It will take effort, but it will pay off. You need something that will occupy your mind and hands. If you’re eating at night due to emotions, you need to focus on getting in touch with what’s going on and taking care of yourself in a way that really works. Find a nonfood method of coping with your stress. Brush your teeth right after dinner to remind you: No more food. Eat without engaging in any other simultaneous activity. No reading, watching TV, or sitting at the computer. How can I control my raging sweet tooth?? Are you the kind of person who does better if you make up your mind to do without sweets and just not have them around? Or are you going to do better if you have a limited amount of sweets every day? One RD reported that most of her clients pick the latter and find they can avoid bingeing after a few days. If your family thinks they need a very sweet treat every night, try to strike a balance between offering healthy choices but allowing them some “free will.” Compromise with low-fat ice cream and fruit, or sometimes just fruit with a dollop of whipped cream. Try 2 weeks without sweets. It’s amazing how your cravings vanish. Eat more fruit. A person who gets enough fruit in his diet doesn’t have a raging sweet tooth. Eat your sweets, just eat them smart! Carve out about 150 calories per day for your favorite sweet. That amounts to about an ounce of chocolate, half a modest slice of cake, or 1/2 cup of regular ice cream. Try these smart little sweets: sugar-free hot cocoa, frozen red grapes, fudgsicles, sugar-free gum, Nutri-Grain chocolate fudge twists, Tootsie Rolls, and hard candy. Walk around the mall three times before you start shopping. Make exercise a nonnegotiable priority. Remember, EAT before you meet. Have this small meal before you go to any parties: a hardboiled Egg, Apple, and a Thirst quencher (water, seltzer, diet soda, tea). As obvious as it sounds, don’t stand near the food at parties. Make the effort, and you’ll find you eat less. At a buffet? Eating a little of everything guarantees high calories. Decide on three or four things, only one of which is high in calories. Save that for last so there’s less chance of overeating. Scramble eggs in a nonstick skillet. Pop some asparagus in the microwave, and add whole wheat toast. If your cholesterol levels are normal, you can have seven eggs a week! A bag of frozen vegetables heated in the microwave, topped with 2 tablespoons of Parmesan cheese and 2 tablespoons of chopped nuts. A smoothie made with fat-free milk, frozen fruit, and wheat germ. The smallest fast-food burger (with mustard and ketchup, not mayo) and a no-cal beverage. Then at home, have an apple or baby carrots. A peanut butter sandwich on whole wheat bread with a glass of 1 percent milk and an apple. Ignoring “Serving Size” on the Nutrition Facts panel. Snacking on bowls of nuts. Nuts are healthy but dense with calories. Put those bowls away, and use nuts as a garnish instead of a snack. Thinking all energy bars and fruit smoothies are low-cal. Juice has as many calories, ounce for ounce, as soda. Set a limit of one 8-oz glass of fruit juice a day. Use mustard instead of mayo. Cut back on or cut out caloric drinks such as soda, sweet tea, lemonade, etc. People have lost weight by making just this one change. If you have a 20-oz bottle of Coca-Cola every day, switch to Diet Coke. You should lose 25 lb in a year. Take your lunch to work. Have mostly veggies for lunch. Have a V8 or tomato juice instead o a Diet Coke at 3 pm. Doctor your veggies to make them delicious: Dribble maple syrup over carrots, and sprinkle chopped nuts on green beans. Mix three different cans of beans and some diet Italian dressing. Eat this three-bean salad all week. Don’t forget that vegetable soup counts as a vegetable. Use prebagged baby spinach everywhere: as “lettuce” in sandwiches, heated in soups, wilted in hot pasta, and added to salads. Spend the extra few dollars to buy vegetables that are already washed and cut up. Really hate veggies? Relax. If you love fruits, eat plenty of them; they are just as healthy (especially colorful ones such as oranges, mangoes, and melons). Keep seven bags of your favorite frozen vegetables on hand. Mix any combination, microwave, and top with your favorite low-fat dressing. Enjoy 3 to 4 cups a day. Makes a great quick dinner. “The best portion of high-calorie foods is the smallest one. The best portion of vegetables is the largest one. Period. Those are all awesome weight loss tips and the ones I use almost everyday are, eating three balanced meals including breakfast, 1 hour of physical activity and eating fat-burning foods. Whole grain, lean meats and low-fat dairy products are my favorite. This is a whole lot of detail of how to diet really well. With seventy-five tips, I doubt there will be a time I run out of things to consider as I diet. Often times I get a bit bored with my diet because it is simply about the numbers going up and down on the scale. Knowing what I am eating and what it does to me will help my dieting get easier. One smart idea for weight is by joining an organization such as Jenny Craig. They have a built in support system and resources available to you. If you are able to afford it, these organizations can be a wise investment. For more info visit ReShape Ready- intragastric balloon weight loss . Welcome New Camp: Tomball Texas Fit Chicks!! Welcome New Camp: Sanger Texas Fit Chicks!!!! Little Elm/N Frisco TFC Chick Transformation!